Chicago Blackhawks forward Patrick Kane is in elite company when it comes to stringing together points. With a last-gasp assist on an empty-net goal in a 3-1 victory against the Winnipeg Jets on Sunday, Kane extended his scoring streak to 22 games; he has 13 goals and 36 points during it. In the process he broke the Blackhawks record of 21 games held by Bobby Hull since the 1971-72 season. Kane also has the longest NHL scoring streak by an American-born player, and is closing in on Sidney Crosby's 25-game streak for the Pittsburgh Penguins from Nov. 5 to Dec. 28, 2010. When the Blackhawks host the Nashville Predators on Tuesday (8:30 p.m. ET; CSN-CH, FS-TN), Kane will have the opportunity to extend a streak that already has defied the odds. Throughout his career, Kane has scored in 392 of his 603 games and, all else being equal, a player with a 65 percent chance of scoring on any given night has a 1 in 13,000 chance of scoring in 22 straight games. The potential of injuries, stellar goaltending play or plain bad luck all conspire against a player attempting to string a series of games with points together. Aside from Crosby, Dany Heatley is the only player to score in at least 22 straight games, accomplishing it as a member of the Ottawa Senators to start of the 2005-06 season. Henrik Zetterberg of the Detroit Red Wings has a 24-game scoring streak, but it spanned two seasons. He scored in seven straight games before his 2006-07 season came to an end because of a wrist injury, and then opened the 2007-08 season with a 17-game scoring streak. Even when allowing for injury-related absences and offseason pauses like Zetterberg's, this chart shows just how difficult it is for Kane’s peers to put together scoring streaks like the one the Blackhawks forward is enjoying now. To put Kane’s streak into further perspective, he has scored more points during it than any other player has scored for the season. Jamie Benn and Tyler Seguin of the Dallas Stars, are tied for second in the NHL in scoring with 35 points each. If Kane scores in each of the next six games, he will become the seventh player in League history to score in 28 consecutive games and the first since Mats Sundin, who scored in 30 straight games for the Quebec Nordiques in 1992-93. In chronological order, the others are Guy Lafleur of the Montreal Canadiens, Wayne Gretzky, who did it four times with the Edmonton Oilers, Mario Lemieux, who did it two times with the Pittsburgh Penguins, Edmonton defenseman Paul Coffey, and Steve Yzerman of the Red Wings. 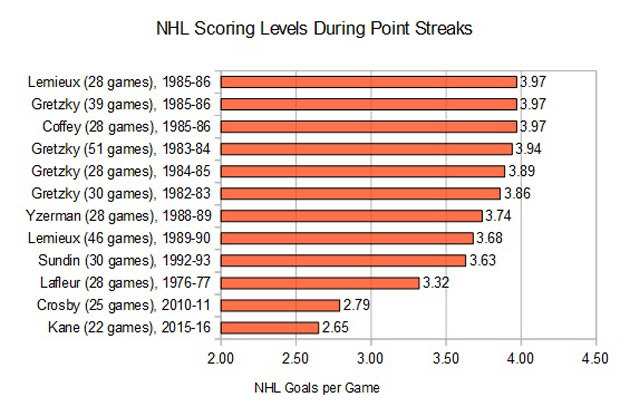 In fairness to Kane's tremendous streak, League scoring levels were much higher for the majority of the streaks that have eclipsed 25 games. As the following chart demonstrates, teams averaged close to four goals per game in the 1980s, compared to 2.65 goals per game this season. Statistically, scoring in 22 consecutive games in the modern NHL is much more difficult than scoring in 28 games in an era when scoring was far more prolific. In absolute terms, Gretzky's all-time record of scoring in 51 consecutive games is out of reach, but Kane has had a larger share of Chicago's total offense during his streak than Gretzky had of the Edmonton offense during his. Kane has either scored or assisted on 57.4 percent of Chicago's scoring throughout this streak, compared to 51.2 percent for Gretzky during his 1983-84 streak. It's easier to get your name on the scoresheet when your team is averaging 5.86 goals per game, as Edmonton did during Gretzky's 1983-84 streak, compared to 2.90 for the Blackhawks of today. The Blackhawks have scored no more than five goals in a single game during Kane's streak, which they have accomplished twice, while the Oilers scored six or more goals in 37 of 51 games during Gretzky's run. Kane has managed to extend his streak despite his team being kept to a single goal five times in the past 22 games, something Gretzky had to achieve only once during his streak. 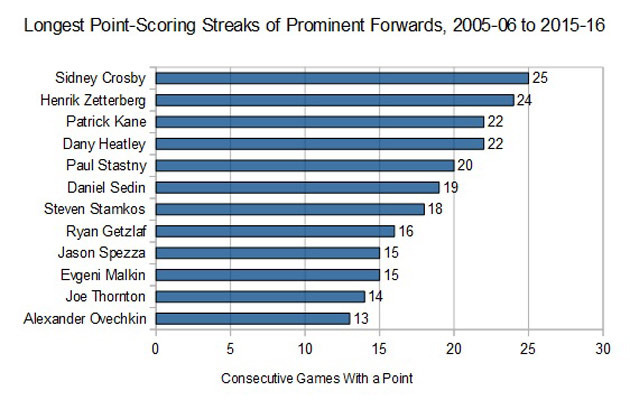 However the numbers are crunched, it is quite clear Kane's performance already ranks as one of the most impressive scoring streaks in history. It is the longest in history by an American-born player, longest in the history of the Blackhawks, is three games behind Crosby's 25-game mark, the longest since 2005, and rivals the degree of difficulty of the longest streaks in history, once scoring levels are factored into the equation.